Take The Famous Hoosier Quiz! It wasn't David Letterman. And forget about Dan Quayle too. The famous Hoosier title went to pop star Michael Jackson on Wednesday. The Gloved One went back to his hometown of Gary, Indiana, for the first time in 20 years. Mayor Scott King presented him with the key to the city. The mayor reminded him not to stay away so long now that he has the key. 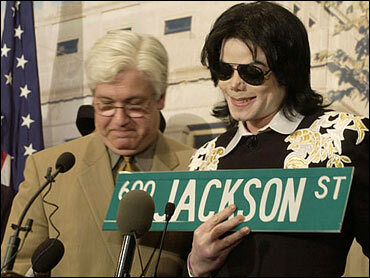 Jackson was not expected to speak to the press, but did, saying he was being treated like a king. "It's great to be home," Jackson said. "Your hospitality is overwhelming." The pop star called it a "wonderful, magical day." and signed autographs after the news conference. memory lane at his boyhood home and a tribute to Gary military troops.